Some of the seized cash out in display Friday by Border Patrol officers. The Border Patrol says it has arrested two men they believe tried to smuggle $3 million in cash into Mexico from California. Authorities say another car sped off as the first vehicle was stopped but it was later found abandoned nearby. 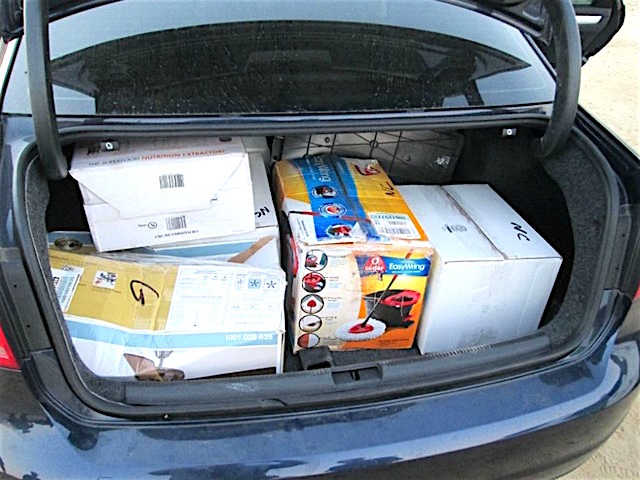 That car, a Volkswagen Passat, had more than $3 million packed in boxes in the trunk. The driver was found hiding in some brush. Both men — one a U.S. citizen and the other from Mexico — were arrested on suspicion of currency smuggling. It’s considered the largest-ever currency smuggling operation in the San Diego sector, U.S. Customs and Border Patrol officials said. The arrests were made Tuesday afternoon in Escondido when a Border Patrol agent stopped a Kia Forte on West Country Club Lane after following the car on Interstate 15. The agent suspected that the driver was traveling in tandem with a Volkswagen Passat, which sped off as the Kia driver was being pulled over, according to the CPB. The $3M Kia Forte in question. Agents who searched the Kia, after a K-9 unit alerted them, discovered eight vacuum-sealed bundles of cash totaling $33,880 stashed in the car’s center console. The 53-year-old man who was driving the Kia was arrested on suspicion of currency smuggling, officials said. He was described as a U.S. citizen, but his name was withheld. More agents were called in to assist, and the Volkswagen Passat was found abandoned in a residential cul-de-sac near where the Kia was pulled over. Eight boxes found in the trunk of the VW contained $3.018 million in currency, according to the agency. The driver, a 41-year-old Mexican national whose name was withheld, was found hiding in some nearby bushes and taken into custody. He was also arrested on suspicion of currency smuggling. Photos provided by the Border Patrol showed the eight boxes stuffed in the trunk of the VW and dozens of bundles of $100 bills stacked on a table. The suspects were turned over to Homeland Security investigators to face federal charges. By comparison to other cash seizures in recent years, border agents at the San Onofre checkpoint found $291,000 in a car, tucked amid baby supplies and boxes of laundry detergent, in 2014. Another seizure that year netted $51,000, and in 2013, $43,000 was found in a car. Be the first to comment on "Border Patrol seizes $3M in Escondido"